With the Hulk busied in his new monthly title and the stories of Incredible Hulk more closely focused on the actions of Hercules and Amadeus Cho than the green goliath, last month the book was appropriately re-christened Incredible Hercules. It’s still a kind of companion piece to the Hulk’s daily adventures, as the pair had worked feverishly to help Banner out during the events of World War Hulk, but it’s not really the green spotlight that it used to be. This month, after an infusion of hydra blood drove him into a mindless fury, Hercules has become little more than a weapon in Cho’s plan to completely and utterly eliminate SHIELD. With the Mighty Avengers hot on their trail, the duo finally seems ready to show their hand. As has typically been the case with Hercules, the greatest challenge is with his dialog, since he always speaks in this stilted, outdated verbiage. For the most part, that’s handled nicely here, as he’s kept out of his mind on a rampage for much of the issue, but he still gets a few chances to shout some nonsense about Greek Gods and ancient times. Personally, I can’t stand the way Herc, Ares and Thor speak, but the style has its fans and I can handle it in small doses like we’re given here. So long as the “verily” count is kept low, I think I can deal. 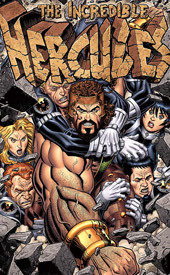 Most of the issue involves a series of muddied flashbacks, as Hercules’ mind bounces from one chapter of his history to another. It’s actually a fun ride, especially once the Mighty Avengers pick up on that and start to use his delusions against him. The Black Widow looks like a genius with her effortless containment of the impervious Greek, and her subsequent rapport with her old teammate is a nice bit of characterization on both parts. This may not be Brian Michael Bendis writing the Mighty Avengers, but the team doesn’t miss a step under Greg Pak and Fred Van Lente. Khoi Pham’s artwork was a nice surprise. A mixture of the Kuberts’ outstanding compositions and Leinil Francis Yu’s intense attention to detail, Pham still leaves room to make his own mark. Whether he’s working in the past (the issue opens with a violent flashback to Homeric Troy) or the present, the artist briskly sets the locale with a series of backdrops that are detailed enough to tell the story, but not so overly rendered as to distract from the central characters. When he handles a moment of pure action, such as Herc’s on-a-whim dismissal of a pair of charging chariots, it’s both beautiful and exciting. At times, he closely toes the line between simplicity and recklessness, and I don’t think he put everything he had into a few of these pages, but for the most part I was happy with Pham’s contributions. Hercules and Amadeus Cho have come a long way since I was first introduced to them during World War Hulk, as they’ve turned into a legitimately interesting tandem. Cho in particular is cast in just enough shadow to keep readers guessing about his true intentions, while Hercules provides him with the unquestioning muscle to achieve nearly anything. Pak and Van Lente have never been better, and Khoi Pham’s artwork is largely very good, despite a few rough patches. If they can keep up this pace and iron out a few wrinkles, this could be a serious contender. Borrow it from a friend and release your expectations.